I didn’t expect to take so long to show you some more options on my DQS10 quilt, but I wasnt expecting to have a forest fire a quarter of a mile from my house for the last few days!! There was lots and lots of smoke around, ashes falling in the yard and fire department trucks everywhere, but most of the fires are out now and everyone is safe! Our Volunteer Fire Department is AMAZING!!! 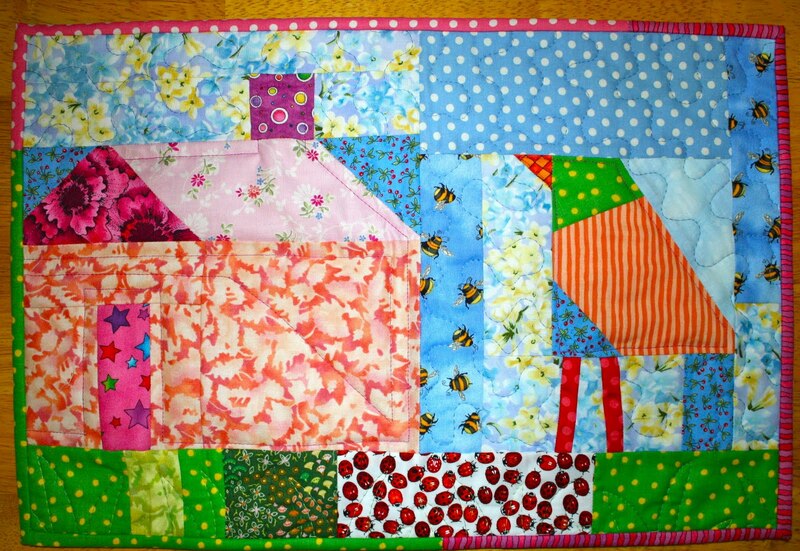 So for my DQS10 quilt…..I got to play with it this morning and finish off the binding. This is the option I think I am liking, which several people suggested. It is not ironed on and stitched down yet. 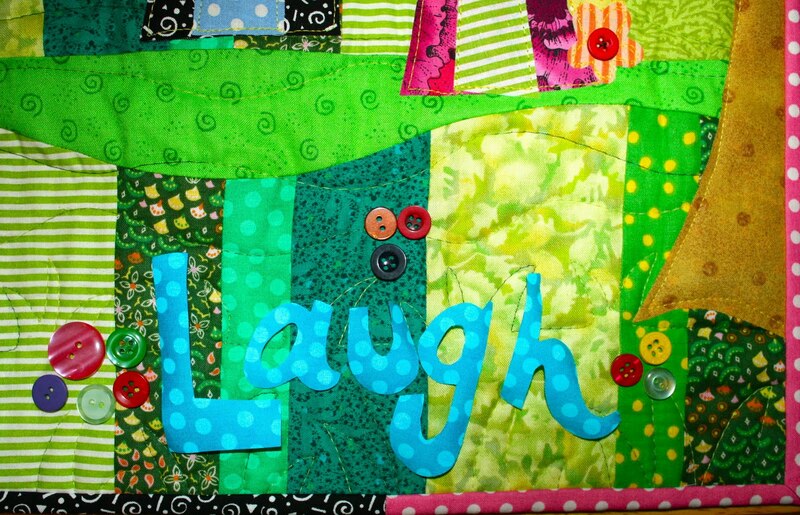 This quilt was inspired by the book “Whimsyland” by Liz & Beth Hawkins. I tried to put a few of my own touches on it. Thank you so much for all your comments and ideas!! I really appreciated them! Let me know what you think of this before I iron it down. I also got a UFO finished this week….. Remember back in one of my late December posts I told you about all these little projects I needed to finish? This is the second of three place mats made from random blocks I had leftover from various projects. Two down and one to go! 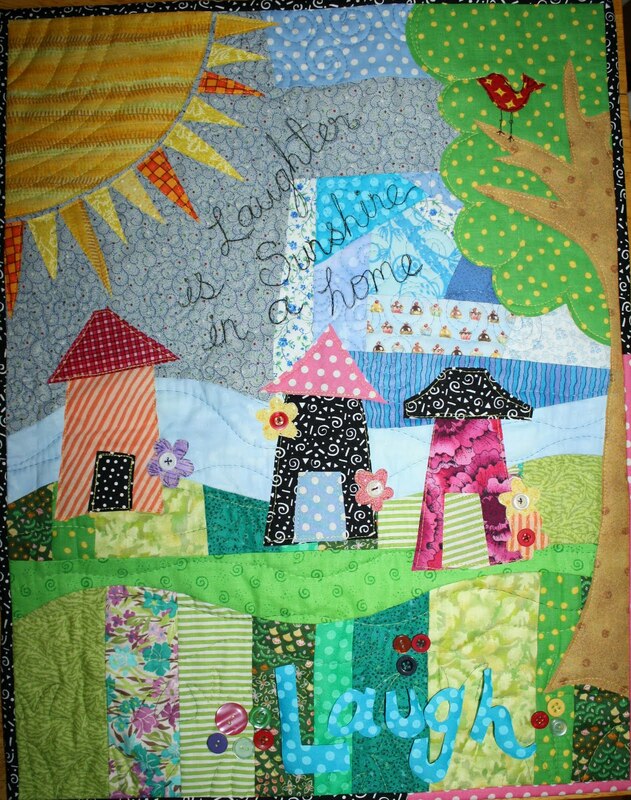 This entry was posted in doll quilt swap, placemats, swaps. Bookmark the permalink. ← HELP!! ~ I Need Advice! I really like what you have done – the buttons look great now nad the word stands out! Lovely! You do such a cool job on everything! I love them both! I think you've got it, too! This looks great, love the color of the fabric and the dots. Even the font looks good. WOW so much work in that!